Habitat. Sugar Maples are an attractive maple that can be used for shade as well as beautiful lumber. Also known as Rock maple or Hard Maple. 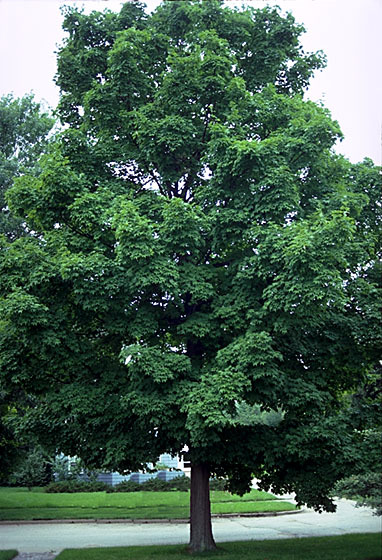 In open areas sugar maple forms a large round crown with many branches nearly to the ground. In the woods the trunk can be 50 or more feet to the first branches thereby becoming a very valuable veneer log. Prefers moist well drained soils but is adaptable to dryer conditions. Here on the farm they seem to do well even on our sandy hilltops. Leaves. Sugar Maple leaves are serrated 3 to 5 lobed, 3-5 inch leaves that are smooth with a waxy but not shiny surface, varying from a bright, light yellow green to medium or deep green above, pale, and fine-hairy on the veins beneath. Sugars seem to develop their best color in the colder areas from Minnesota to Maine. Flowers. The flowers on a sugar maple form March to May depending on how far south one is, and are greenish yellow, budding with the leaves. There are times in the spring especially after a rain where the roadways are littered with the fallen flowers of the maple families, especially the silver but also the sugar maple. Fruit. Sugar maple seed pods form in the fall and can be a nuisance. The seed pods sometimes called samurai are 1.5" and fall from the tree like little helicopter rotors. Winter Buds. The buds are small, pointed, acute, about 1/4 inch long and reddish-brown. 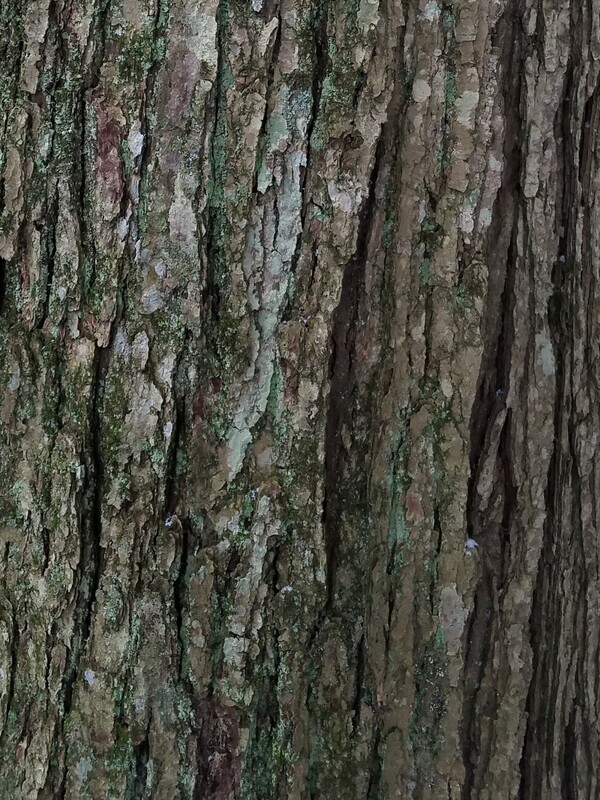 Bark. The twigs on sugar maple are smooth, light brown becoming darker and deeply furrowed, shaggy with long plates and flaky with age. Wood. The wood of the sugar maple is heavy, very hard, strong and close grained, capable of taking on a lustrous shine; it is pale buff white pale brown buff, and weighs 43 pounds per cubic foot. Abnormal conditions of growth cause the sugar maple to produce the irregular and interrupted grain known as curled and bird's eye Maple. As a youth with my first chainsaw I cut into a maple that was curled, not realizing I had a valuable tree. Splitting the wood was nearly impossible by hand and a lesson was learned. Sugar Maple is used for cabinet work, flooring, interior finish and firewood. It is not suitable for moist environments as my father-in-law could testify. He attempted to use kiln dried maple on the deck of his cabin cruiser to save big bucks over mahogany. Within a week on the water it had curled up and had to be removed. He then bought the mahogany. Pests. In the last forty years there has been a persistent problem called maple decline. No one yet has been able to identify exactly what the cause is. It seems to be more prevalent in an urban environment. It hasn't seemed to have gotten worse or better over that time frame. Leaf scorch can be a problem during hot, dry periods. Distribution. Sugar Maple is native to the following places: Connecticut, Delaware, Florida, Georgia, Iowa, Illinois, Indiana, Kentucky, Massachusetts, Maryland, Maine, Michigan, Minnesota, Missouri, Mississippi, North Carolina, New Hampshire, New Jersey, New York, Ohio, Oklahoma, Pennsylvania, Rhode Island, Tennessee, Virginia, Vermont, Wisconsin, West Virginia. Other. This is one of the top trees to plant for fall color as Sugar maples produce vivid red, orange and yellows in the fall and also is an excellent shade and lumber tree. Sugar Maple attains 70-125 ' in height and up to 5' in diameter. and is hardy from zone 4-8. Sugar Maple is a slow to medium grower somewhat faster than a Norway Maple with a growth rate of 8-24" per year depending on conditions. These are the Sugar Maple that produce the sap in the spring for Maple syrup. The sugar -yielding properties of the Maples were known to the Indians even before colonial America. Porcupine Hollow has had a sugar shack producing Maple syrup for over 20 years. When the days start to warm above freezing ad the nights cool to the low 20's we are out burning sap. We still tap a few Sugar Maples using buckets but most sap is collected by piping sap directly from the tree to the shack. 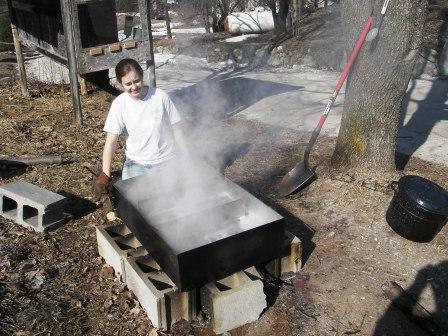 The maple sap is heated to 219 degree boiling point to make the most tasty syrup one can imagine. It takes about 40 gallons of sap to make 1 gallon of syrup. Generally speaking sugar maples do not yield sap south of Virginia. 1. Green Mountain has a very dark green, glossy, waxy leaf suitable for more southerly locations. 2. Apollo is a shorter (25') sugar maple with a compact, narrow form. Good color and great for street or urban garden. Good for zone 4-7. 3. 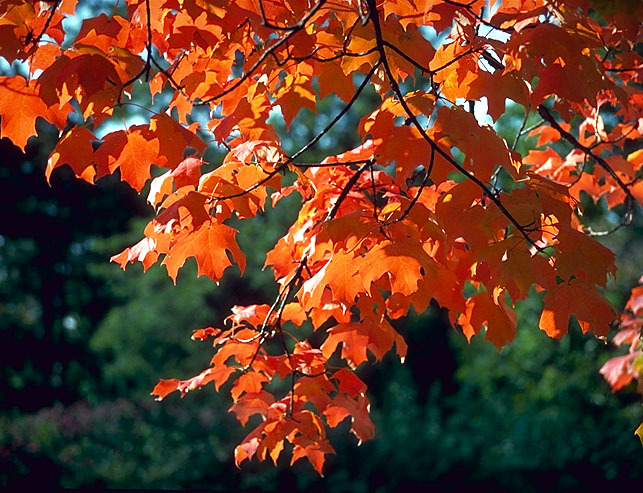 The fall fiesta is a superior fast growing sugar maple to 50', resists sun scald and frost crack. Outstanding fall color, far more reds and oranges than other sugars. Zones 4-7. 4. Black Sugar Maple also known as Acer nigrum is similar to sugar maple and awful hard to tell apart, but is noted for its great drought and heat resistance. A beautiful tree for the southern areas. Zone 4-8. We still have plenty of the cultivars left. We sell Sugar Maple seedlings wholesale and retail. There are quite a few subspecies that are related: Southern Sugar Maple, Rocky Mountain Maple, Western Sugar Maple, Chalkbark Maple, Boxelder and Black Maple. To buy Sugar Maples use the table below. Sugar Maple in the spring Sugar Maple leaf in the fall. Old and new style of bag. 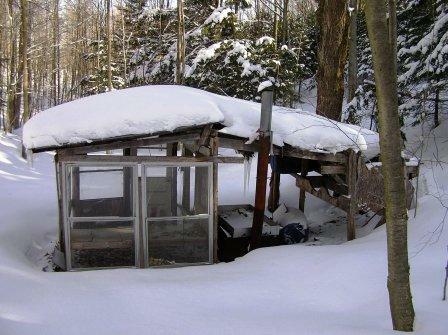 Maggy is making her private stash of maple syrup mm good the sugar shack 140" of snow and she couldn't take it no more. To order Sugar Maple by PHONE: We're glad to take your order by phone @231-544-6769. Phone orders can be charged to VISA, Discover, AmEx or MasterCard accounts.